Only post about topics of direct interest to the Lake community. That means: No politics. No topics tangentially related; e.g., this is not the place for your reflections on global warming, even though it clearly affects the Lake. No posts about what a wonderful time your family had at the Lake unless there is something specific in your stay that will be interesting to people who don’t know you. When in doubt, feel free to ask one of the blog’s administrators: Paula Hatch, Chuck Pierce, or David Weinberger. Please keep your tone pleasant and light. Be informative and helpful. Posts critical of individuals will be removed; this is not the place for that. We encourage you to include photos in your posts. We strongly encourage you to tick the relevant “category” boxes. For example, if you’re posting about a wildlife sighting, tick the “wildlife” category, and if you’re including a photo, tick the “photos” category. Posts can have more than one category. That way, someone who wants to see all the posts about wildlife, or all the posts that contain photos, can click on that category’s link. Anyone can have their photos show up on the front page in the vertical list. See the FAQ for details. Only people with permission can create blog entries on this site. To request permission, please send an email to either Chuck Pierce or David Weinberger. Once you have permission to create a post for the first time, go to the WordPress authoring page. To the right of the edit box are two tabs: Visual and Text. Click on Visual to edit in an easy environment much like a word processor. Click on Text if you’re familiar with editing raw HTML. To add a photo, click on the camera icon on the upper left of the edit box, next to the label “Upload/Insert.” This will let you upload a photo from your computer, or link to one on the Web. 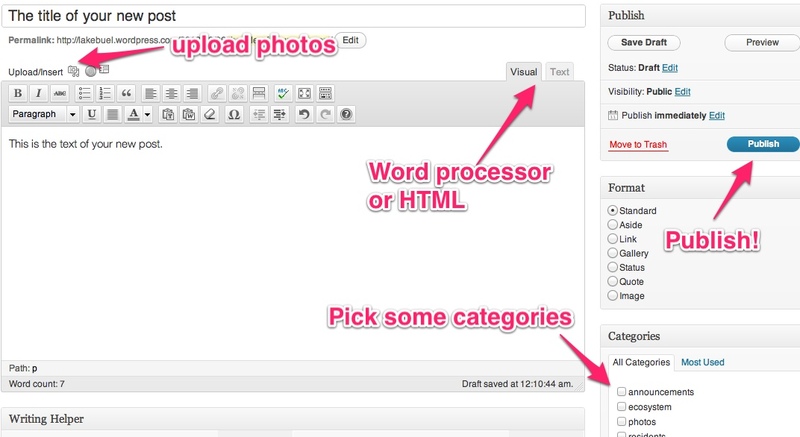 Be sure after you’ve uploaded it to scroll down to see the options, and so that you can click on the “publish” button. Please select the appropriate categories from the list at the right. Press the “Publish” button when you’re done. Congratulations! You’ve posted your first post!